Did you know that student housing is one of the best performing real estate classes for investment? That’s right off-campus housing is blowing up but owning the properties is not the only way to make money from the horde of students that descend on your town every year. 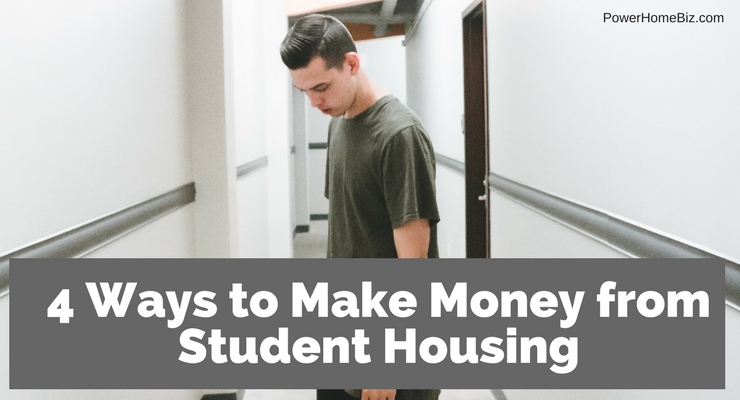 In fact, there are several ways to make money from student housing and this article is going to look at four of the best. As the name implies this is the provisioning of off-campus housing for university students. If you have ever lived in a dorm, then you know that the first thing you want to do is to live off campus as it is the only way to get some privacy – and to study. In addition, living off-campus means that you don’t have to live under all the rules put in place by the college. Now, this doesn’t mean that off-campus housing will resemble the Delta Tau Chi fraternity house from Animal House. In fact, many of these properties are well integrated with the residential neighborhoods that ring major colleges and universities around the country. While not everyone has the money to get into the property business, you don’t have to fear as there are many service businesses that you can get into which cater to this market. In many places, off-campus housing is all about taking existing structures and converting them to the needs of students. While this might sound straightforward, the reality is that it requires an understanding of the best ways to repurpose an existing property for students. For example, student housing architects, Oz Architects, specialize in creating spaces that promote interaction, inspire learning, and foster community. This is important as it helps to create spaces where students will not only want to live but will also pay a premium to do so. But you don’t need to a be a big architecture firm to cash in. In fact, you can be a one man (or woman) design shop or maybe you focus on something like interior design or a trade like plumbing or electrical work – after all, these converted houses will need private bathrooms as well as being wired for high-speed internet. If you’re not a licensed architect and you are hopeless with a hammer you don’t have to worry as there is another way you can make money from student housing – services. That’s right things like cleaning services, landscaping, laundry are all ways to make money from the students living in your area. The plus to these businesses is that they don’t require much in the way of investment and you can essentially run them out of your home. This means that you don’t need to pay for expensive offices or storage spaces. All that you will need to do is find a way to market your service offering to students or landlords in your community. One of the best ways to get the word out about your business is to focus on social media, such as Facebook, Twitter, or even Snapchat – after all, today’s kids are all over this service. Not only will this help you to get in touch with your community but it will also open the door for referrals. This could mean that you will spend almost nothing on business development as customers will find you instead of you needing to search for them. If you don’t think you can make money from these services, well think again. One plus of today’s students is that most of them have no real idea how to take care of themselves. Meanwhile, their parents don’t want the liability of being on the hook for any damages their children to cause to their housing. As such, many are willing to pay a premium for services that make their time at college a lot like being at home. Granted, much of student housing rental business is conducted via word-of-mouth. That is where a graduating friend will refer a property to their friend who is still in school. In this way, a property tends to pass through generations of friends at a certain school. However, the explosion of investment in student housing means that there is more competition for students and this opens the door for specialty brokers who help to connect students with landlords. This business model is a good opportunity for someone who has recently graduated and not only has a solid connection with the local student population but also knows many of the landlords in town. As previously mentioned, today’s college students are pampered. Gone are the day of packing everything in garbage bags and footlockers. This has been replaced by concierge moving and storage services that help students set up their apartments even before they return to school in the fall. To get into this business you will need a truck, or trucks, access to a storage facility, a strong back, good organizational skills, and importantly insurance. But the odds are that this is an underserved need in your college town. There you have it, four ways to make money from student housing. With school back in session check out which ones you think would be the right move for your next small business.